The 4th edition of the International Journalism Festival  will take place in Perugia, Italy on 21-25 April 2010. Rooted in the Etruscan origins of its home-town, the Festival is broadly focused on the future of journalism and communication. It will be a place where columnists, leading journalists and other representatives of mainstream media will sit face to face with citizen journalists, activists and other people involved in alternative media production—in an attempt to find a larger collaboration between new and traditional media. L'obiettivo? Parlare di giornalismo, informazione, libertà di stampa e democrazia secondo il modello 2.0. Un evento nato dal basso, aperto alle “incursioni” degli utenti, un evento unico dove i protagonisti dell’informazione provenienti da tutto il mondo si incontrano con i cittadini, i lettori, gli studenti, i professionisti, in un flusso continuo di idee, scambi, confronti. I media giocano un ruolo fondamentale nelle nostre vite quotidiane ma spesso vivono di autoreferenzialità. Il festival rompe in qualche modo questo muro grazie al suo format e rende vivo e vitale l’incontro tra chi fa informazione e chi ne usufruisce. The objectives? Addressing journalism, information, press freedom and democracy according to a 2.0 model. A grassroots event open to user “raids”, a unique occasion where prominent media representatives from all over the world will meet citizens, readers, students, professionals in a continuous stream of ideas, brainstorming, crossfire. Media play a fundamental role in our daily lives but often suffer from a self-reference trend. Our festival aims at breaking through this wall with a format that makes it alert and inclusive, facilitating a live connection between information producers and users. 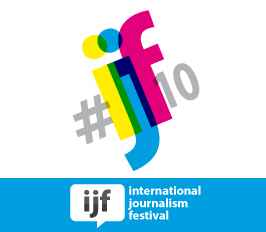 Founded in 2006 by Arianna Ciccone and Christopher Potter, the IJF 2009 edition hosted more than 80 different events, 220 speakers, over 260 accredited journalists and almost 300 volunteers from all over the world. This 2010 edition promises to be even larger and more crowded. The whole event is supported by a small number of sponsors and the involvement of several media partners, including Global Voices Online. Indeed, two Global Voices-based panels  will be hosted on Wednesday April 21 and Thursday 22, both moderated by Italian Lingua  editor, Bernardo Parrella: “Bridging the gap between different languages and cultures online”, with David Sasaki , Marc Herman , Portnoy Zheng  and Nicola Bruno (Totem  [it]); “Citizen media to foster human rights and freedom of speech”, with the presence of Jillian York , Sami Ben Gharbia , Gianni Lannes (Terra Nostra  [it]), Gabriele Battaglia (PeaceReporter  [it]). The program  includes other panel discussions focused on citizen journalism and new media from an international perspective. “Middle East media: chocks away!” will address the social web development in Arab countries, also pointing to Al Jazeera and its Creative Commons repository  as an example of new digital journalism. “Women, the media and power” is a series of four panels on the role of women in the media, while a Barcamp on “media and crowdsourcing” will take place Sunday 25th. Aiutateci please!!! Emergenza informazione in italia!!!! Per informarmi sul mio paese sono costretta a leggere articoli dei giornalisti stranieri!! Help us please!!! Information emergency in Italy!!! To keep myself informed on my country I have to read articles written by foreign journalists!! Dear collegues! I will represent the International League of Young journalists at the festival. If anybody likes to join – you're always welcome. We are a community of active young journalists who want to make this world better. Function to click individual words is from Answers.com  Extension. Online Education  should be free.